The 22nd Annual HBS Early Brass Festival was just that and much more. Held in Northfield, MN on July 27-August 1, 2006, it was a joint conference with the Austrian organization, Internationale Gesellschaft zur Erforschung und Forderung der Blasmusik (IGEB) [The International Society for the Investigation of Wind Music Research], titled, "Music Away from Home: Wind Music and Cultural Identity: An International Conference." Thirty-seven scholars presented papers on a wide range of subjects dealing with the conference theme. Running concurrently was The Vintage Band Festival with 21 wind ensembles performing in the Northfield town square and in bars, restaurants and every nook and cranny of the town imaginable. 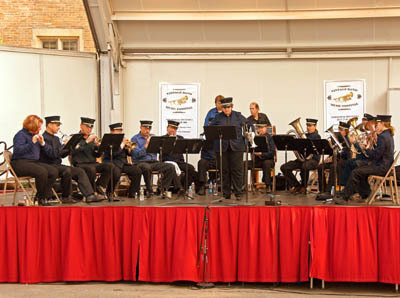 The ensembles in the Festival included the 26th North Carolina Regimental Band (re-created), Ameriikan Poijat Finnish Brass Band, the Brassworks Band, the Carlisle Town Band, the Chatfield Brass Band, the Chestnut Brass Company, Craig Ebel's Dyvefrsco Polka Band, the Dodworth Saxhorn Band, the Dolce Wind Quintet, the Fairbault Bandshell Brass Band, the Fridley City Band, the Lake Wobegon Brass Band, Newberry's Victorian Cornet Band, the North Star Cinema Orchestra, the Original German Band of New Ulm, Passion des Cuivres, the Rocky Mountain Swiss Alphorn Trio, the Sheldon Theatre Brass Band, the Windworks Wind Quintet, and the First Brigade Band of Wisconsin. The six 100-plus-degree days of the event were among the hottest in recent Minnesota memory. The performances were uniformly outstanding but the 26th North Carolina Regimental Band brought their dedication to authenticity to new heights, wearing uniforms of thick gray jeancloth (wool and cotton blend) in the fashion of their Civil War musical ancestors. 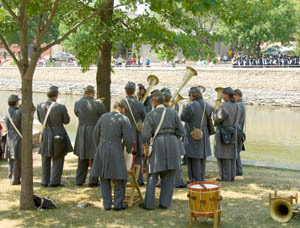 On Saturday afternoon there was a staged "battle of the bands" with the 26th North Carolina and the Wisconsin First Brigade Band camped out on either side of the Cannon River playing favorites of the Blue and the Grey. 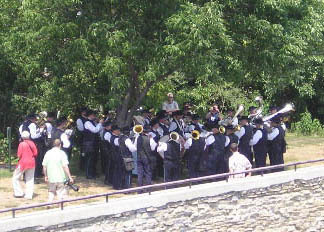 In the spirit of peace, they concluded the performance with a combined rendition of "Home Sweet Home," joining forces on the bridge overlooking the river. They both played beautifully but it is something of a miracle that no bandsman was wounded in that "battle" by heatstroke! There were many activities presented and it seemed that Paul Niemisto, the Conference and Festival organizer, managed to get the support of not only Northfield Mayor Lansing and other city officials but also the support and participation of what seemed to be practically every restaurant, pub, store, and citizen of the entire town! Several days before the conference a trip was organized to visit the National Music Museum in Vermillion, SD. This outstanding institution is a five-hour drive from Northfield. Several receptions were presented by local officials and businesses. A vintage baseball game was played on Saturday afternoon and all the historical details were well tended to such as the use of a baseball softer and larger than that used today as well underhanded pitching, no gloves, and rules that dictated no leading off, no sliding, no bunting, and if a fielder caught a ball on the bounce, the batter was out! There were cotillion dances with many participants in period costumes where many of the different ensembles performed. Conference participants were treated to a parade of hot air balloons that were flew from St. Olaf's College to the nearby Carleton College campus. 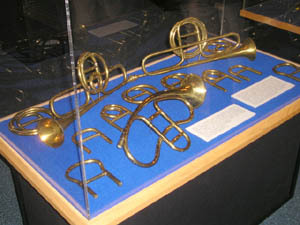 Selected outstanding brass instruments from the Schubert Club's Kugler Collection were presented in a dowtown display. 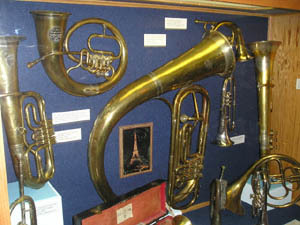 Among the many wonderful instruments was a beautiful circular, 5-valve, silver Fiske cornet. There were many activities presented and it seemed that Paul Niemisto, the Conference and Festival organizer, managed to get the support of not only Northfield Mayor Lansing and other city officials but also the support and participation of what seemed to be practically every restaurant, pub, store, and citizen of the entire town! Several days before the conference a trip was organized to visit the National Music Museum in Vermillion, SD. This outstanding institution is a five-hour drive from Northfield. Several receptions were presented by local officials and businesses. A vintage baseball game was played on Saturday afternoon and all the historical details were well tended to such as the use of a baseball softer and larger than that used today as well underhanded pitching, no gloves, and rules that dictated no leading off, no sliding, no bunting, and if a fielder caught a ball on the bounce, the batter was out! There were cotillion dances with many participants in period costumes where many of the different ensembles performed. Conference participants were treated to a parade of hot air balloons that were flew from St. Olaf's College to the nearby Carleton College campus. 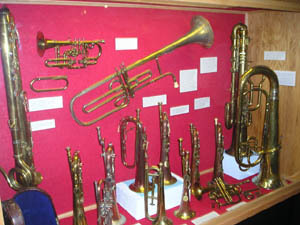 Selected outstanding brass instruments from the Schubert Club's Kugler Collection were presented in a dowtown display. Among the many wonderful instruments was a beautiful circular, 5-valve, silver Fiske cornet. Of course, with so many period brass ensembles in attendance, there was a constant show-and-tell of rare and interesting instruments going on throughout the event. Tuba player and photographer Mark Chalabala presented an exhibit of vintage band posters and photographs from his large collection as well as original photographs of brass instruments that he has taken. Sunday was an excursion day with some participants going on a planned Mississippi River boat trip. Monday saw the presentation of a Vaudeville night with a wonderful band, singers, a comedian (telling the worst corny jokes, in true vaudevillian tradition), a dancing dog act, and the showing of Chaplin's silent film, The Immigrant. The film with accompanying live music, was poignant and hilarious as only Chaplin can be. There was also a trip to the Chatfield Band Music Library which houses one of the largest collections of band repertoire in the country. The conference was the first joint-event with the HBS and IGEB with speakers and participants representing both organizations. At the HBS membership meeting President Jeff Nussbaum remarked that it was at least seven years ago that Herbert Heyde encouraged him to organize a conference with IGEB as both organizations have so many overlapping common interests. All were thrilled that it finally came to fruition and members from both groups had a chance to learn from each other. IGEB President, Bernhard Habla echoed those sentiments. At the meeting it was learned that in an effort at attracting the interest and involvement of younger brass players and scholars, an award will be established to support deserving young brass musicians to travel and attend future HBS events. Seed money from a major foundation is currently being explored. Sabine Klaus, Curator of the Joe and Joella Utley Collection, will host the 2007 23rd Annual Early Brass Festival, August 3-5, 2007 at Converse College in Spartenburg, SC. A special tour of the Utley Collection is planned and she presented a PowerPoint presentation of next year's festivities.